HISTORY LESSON: Students at Stuart Country Day School recently heard the Right Honorable Earl Castle Stewart talk about his aunt, Janet Erskine Stuart, for whom the school is named. 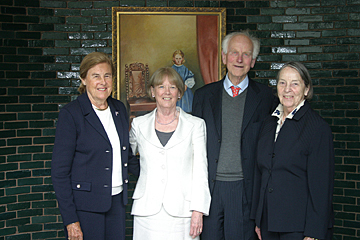 Pictured (from left) Stuart founding mother Mary Murray Garrett; Mr. Stuarts wife, The Countess Castle Stewart; Mr. Stewart; and one of the three founding mothers, Millie Harford. The Spring 2009 Student Group Show up at the Lewis Center for the Arts at Princeton University features a variety of projects in media ranging from photography to painting to sculpture displayed on three floors of the building.